The final episode clearly had a duty to draw all the strands of this bizarre series together. Now, I don't know about you but I certainly wasn't convinced that Mr. Jolly had been decapitated last week and felt it was too obvious a red herring. Why Mr. Jolly had faked his own death was definitely a question in the back of my mind as we're taken back to Ravenhill Hospital two years previous to the events in the series. So, we knew that all the main characters were inmates in the hospital and that somehow the cruel Miss Kenchington ends up dead as the result of some sort of attack. And of course, the inmates all seemed to be performing musical numbers from Joseph on the video that was anonymously sent to them, well those that could play it on VHS at least. 'I don't know how Trevor Nunn does it, but I have my own prompter if need be', snaps Miss Kenchington as she fires up a lethal cattle prod to, er, stimulate the inmates to put on a good show. Eileen Atkins provides oodles of menace and malevolence as the evil Miss K and is clearly having a lot of fun. 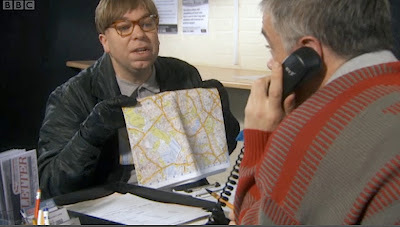 I loved the sequence where David goes into the Haringey Citizen's Advice Bureau and confesses to five murders and it's the local boundaries ('Critchley Gardens is the thin end of the wedge' declares Simon on the front desk) that determine whether he gets his advice from them or the Bureau in Barnet. Probably a frighteningly accurate portrayal of local government red tape. James Holmes as Simon was perfect casting and his delivery was wonderful as he handed David a Crimestoppers leaflet (...'though it might be a bit too late for that'). Back at Ravenhill in the present day, Joy and Mr. Lomax are reunited as he and his new assistant Jennifer come searching for Michael Fry and Snappy The Crocodile. With the rather bloody Freddy chucked, rather wetly, into a bin, Joy assumes the red track suited Jennifer is a grown up version of Freddy after the transfusion of Nicola's blood and thus provides a running gag through the episode. Believe me this is positively naturalisitic when compared to the way the rest of the story unravels. Meawhile, Jelly is still handcuffed to Mrs Wren and whilst she's having a wee at a service station she slumps into a diabetic coma. Only a child fumbling for a pound in Jelly's trouser pocket in exchange for a Topic can possibly revive her. Probably the best scene in the entire episode is the moment on the cliff top, outside the hospital, where Mr. Lomax, now having acquired Snappy, promptly throws the toy into the sea. It's the only cure, it seems, for his psychosis - the man who has everything must have a goal, or as Lomax describes it 'the chase' - and so his collection must always remain incomplete. As Lomax wistfully confesses this, Michael has already walked off and left him. Lomax's cry of 'Tealeaf!' echoes across the cliffs. Pemberton's performance is particularly special. As is his brilliant work as David in the final confrontation with Edwina Kenchington. As she stabs him with the electric cattle prod to drag the correct list of colours for Joseph's coat of said colours, he flips and pushes her to her apparent death. This is where it gets somewhat absurd. Kenchington starts talking to David whilst he visits her graveside and she gets him to dig her out of the grave and whilst all that's going on the rest of the gang are all sealed into a room in what's going to turn into a very odd thriller 'big reveal'. Except it isn't really a big reveal because most of us will have aready worked out that it's Mr. Jolly who has dragged them all back to the hospital. Mind you, I do love the way that Joy and Lomax actually point out that even though Jolly has masterminded their eventual return he's actually been a bit rubbish and not brought along David or little Robert with them. And he does seem rather annoyed that Nicola, Mrs. Wren and Jennifer have all tagged along instead. As we'd previously guessed, they're all back in Ravenhill because of the 'murder' of Miss Kenchington. In another flashback we also discover that our little gang set fire to the ward to cover up the 'accident'. The weirdest part of this episode is what happens to Robert. Driven away in a car by Kerry from the theatre, they both end up in the woods after the car runs out of petrol. They spot a cottage and enter. Kerry goes to use the phone whilst Robert helps himself to a bowl of soup on the table. He sees a mouse (how very 'squeak squeak' symbolic!) run down the cord of the phone only to see that it isn't connected and Kerry is...shock...horror...only pretending to make a call. In this grimmest of Grimm's fairy tales, Robert challenges Kerry and she calls her grandma in from the next room. Robert passes out as an old crone shrieks with laughter at him. Er...pardon? Were they on drugs when they wrote this epsiode? 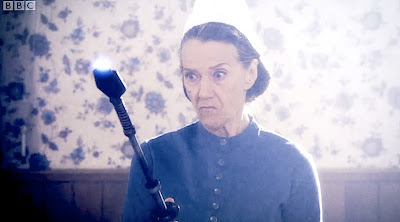 Mrs Wren quite rightly declares, 'I thought at the time that were a bit far fetched' as Jolly reveals he used a fake head to act out his own murder, and she rather sums up the last ten minutes of the episode where Shearsmith and Pemberton simply throw in as many thriller and horror cliches as they can because, well, it's painfully obvious they don't quite know how to end the story. Yes, they find a plausible reason for Mr. Jelly's involvement in the plot - the operation on his RSI preventing Jolly from saving his mother from the flames but then, to top it all, Edwina Kenchington rises from the grave thanks to David. Which is just an absurd coincidence and doesn't make much sense at all. I know, I know...she sent a letter to her son to start the whole revenge story off and the whole series is absurd but up until the last ten minutes it's been behaving according to its own rules and internal logic. There is nothing quite logical about the ending at all. 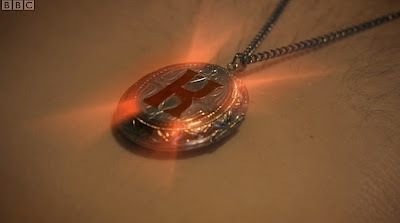 Letters, lockets...and a big explosion that kills all the characters off. Still, with an an eye to a potential second series they've left David alive and Robert is now seemingly in thrall to a witch and her granddaughter, who appear to be about to cook him, and he's wearing the locket that Edwina was looking for. Ooooo! Despite it being beautifully shot, well performed and having much love and care heaped upon it, I felt this last episode somewhat short changed us with the denouement of the story. Much of it we already knew so the element of surprise was diminished and I had a feeling that Shearsmith and Pemberton hastily threw in the business with the locket and the witches as a way of fulfilling a potential second series commission. And they've killed off most of their leading characters. Or have they? No doubt they'll find a barmy way to resurrect some or all of them. An enjoyable series with a mix of genuinely great characters (David and Maureen being the very best) and some rather tiresome ones (Jelly being the most bloody annoying and relying a little too much on the familiarity of Papa Lazarou to properly stand out) and yet not as laugh out loud funny or as addictive as The League Of Gentlemen. I hope it does get a second series because the potential still remains.